Okay, there are a few nuggets of fact in them thar statements. But the truth is, of the four original towns, only Hampton was settled (in 1638) by order of the Great and General Court of the Massachusetts Bay Colony, and from the get-go it came under the protection of the Massachusetts government (Dover and Portsmouth were founded as commercial outposts of the Council of Plymouth, and Exeter was settled by the religious exile John Wheelwright. Then, between 1641 and 1643, Massachusetts absorbed the three towns). Hundreds of records preserved at public and private archives enable us to accurately trace this early history. Eight documents, especially, tell the earliest history of Hampton, from pre-settlement to its first years as a Massachusetts town. 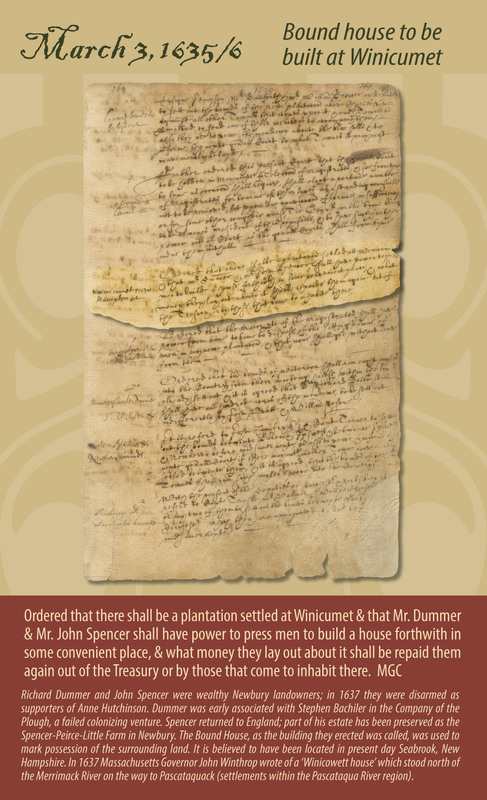 In the first document, dated March 3, 1636, the Great and General Court ordered that ‘there shall be a plantation settled at Winicumet and that Mr. Dummer and Mr. John Spencer shall have power to press men to build a house forthwith in some convenient place.’ The house these wealthy Newbury landowners built was called the Bound House, whose purpose was to mark possession of the surrounding land. Who inhabited this house or for how long is unknown, but it is believed to have been located in present day Seabrook. The second document appeared twenty months later. 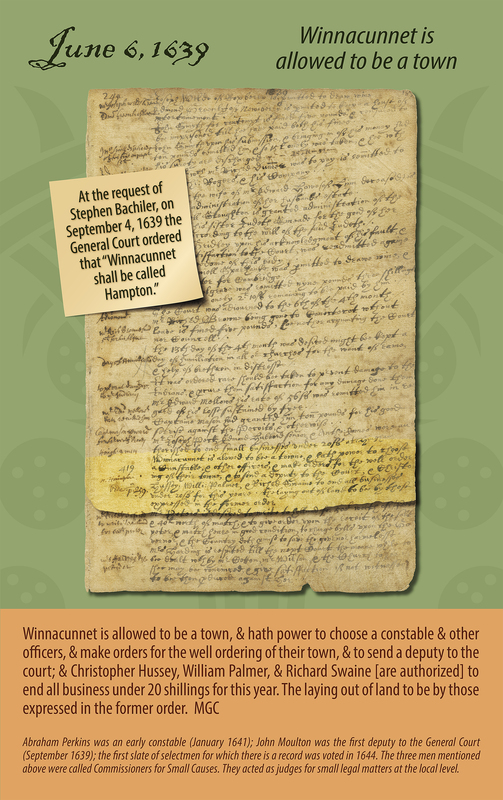 On November 2, 1637, the Court granted the plantation of Winnacunnet to some ‘inhabitants of Neweberry,’ with the stipulation that they settle the area within one year. These individuals, whoever they were, were not able to settle the plantation in the time allotted, and the area remained pristine, a favored summer camping place for small bands of Pennacook Indians who fished in the rivers and planted corn and beans in the meadows. Nicholas Easton was a tanner who emigrated to New England in 1634, was disarmed at Newbury, and banished from Massachusetts. After he was found squatting at ‘Winnacumet’ and kicked out, he moved south, established the plantation of Newport, and became the Governor of the Rhode Island colony (take that, Massachusetts). His fellow squatter Mr. Geoffry was possibly an inhabitant of Newbury or Ipswich. Three months after Easton and Geoffry’s removal, the fourth document, issued by the Court and dated September 6, 1638, gave liberty to Reverend Stephen Bachiler and ‘diverse others’ to begin a plantation at Winnacunnet. Other well-known names from Hampton’s early history appear in this record: Christopher Hussey, Mary Hussey, John Moulton, William Eastow, William Palmer, Robert Tuck, and Richard Swaine. Sensitive to the fact that Massachusetts had no legal right to send settlers to New Hampshire, or perhaps anticipating opposition from Exeter, which did, in fact, protest the new settlement, the Court assigned three prominent Massachusetts men, whose authority no one dared question—Simon Bradstreet, John Winthrop, Jr., and Edward Rawson—to oversee the surveying and assignment of lots at Winnacunnet. Stephen Bachiler’s honey bees were in a tizz. 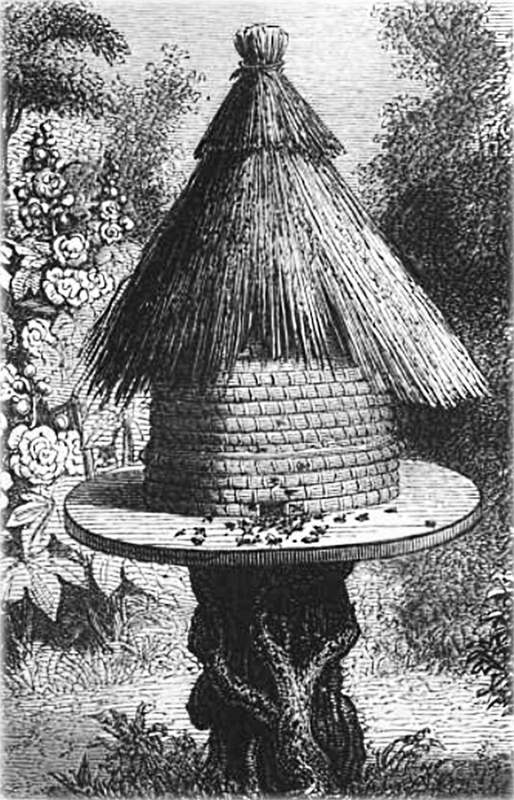 Their hive had been invaded by bees from a foreign stall, one that Bachiler had promised to deliver to John Winthrop, Jr. in Ipswich. It was a gift from Winthrop’s father in law, Reverend Hugh Peters of Salem, the stepfather of Winthrop’s second wife Elizabeth Reade. Suffering from a dearth of nectar, the ‘thievish’ Winthrop bees ‘hath robbed & spoiled’ Bachiler’s beehive. The raid delayed the delivery, and prompted Bachiler to write the fifth founding document, a letter to Winthrop dated October 9, 1638, in which he reported the incident. He also advised Winthrop that he had found a ‘reasonable meet place’ at Winnacunnet plantation and planned to begin settlement the following week, on October 14, the traditional date of the town’s founding. Had it not been for the rogue bees, ‘as the manner of bees is,’ Bachiler would have delivered them to Winthrop, and in so doing would have relayed his plans for settlement in person, depriving us of some important details of the founding of our town. The sixth document is dated June 9, 1639. With the settlement of the plantation resolutely underway, the General Court allowed Winnacunnet to be a town, granting the settlers power to ‘choose a constable and other officers, and make orders for the well ordering of their town, and to send a deputy to the court.’ Abraham Perkins was the first constable on record, William Wakefield the first town clerk, and John Moulton the first General Court representative. At the request of Stephen Bachiler, in September 1639 the town’s name was changed to Hampton, after Southampton, Hampshire, England. 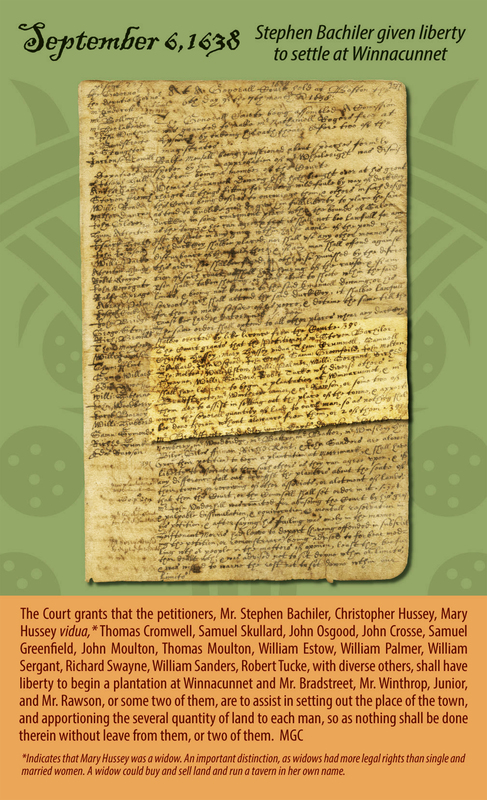 In the seventh document, dated May 13, 1640, the General Court tallied up its bills and commitments and levied a colony-wide tax of £1,200 to cover the costs. As one of the seventeen Massachusetts towns then in existence, Hampton’s share was set at £10. John Moulton and John Crosse were appointed to be the town’s first tax collectors. Money was not the only medium of exchange acceptable to the Massachusetts Bay tax man. The Court decreed that payment in silver plate should ‘pass at 5 shillings the ounce,’ and it valued ‘good ould Indian corn at 5 shillings the bushel, summer wheat at 7 shillings the bushel, rye at 6 shillings the bushel.’ Also acceptable were horses, oxen, goats, hogs, and wampum. Perishable items such as the ‘fruits of the earth’ were not allowed. The spirit of the eighth document, taken from the Hampton town records, is still alive today in the yearly Town Meeting. 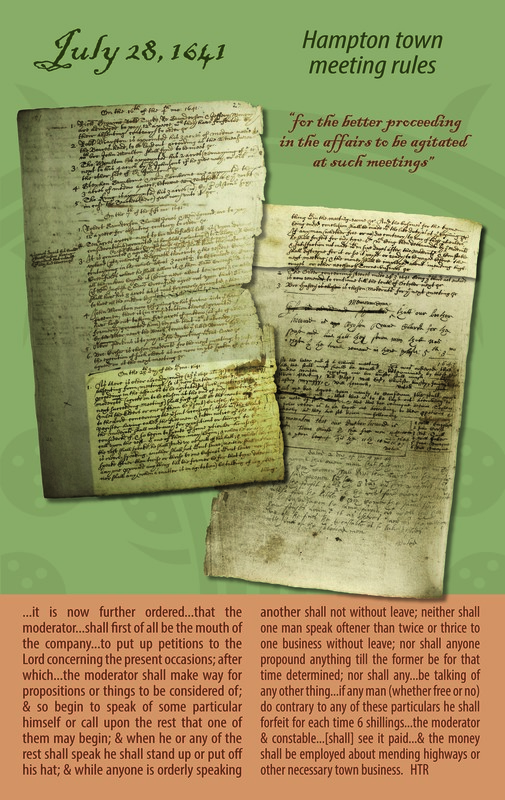 On July 28, 1641, the town established its first written rules ‘for the better proceeding in the affairs to be agitated at [town] meetings.’ Among other things, it shows that the moderator’s job was as important then as it is today. To celebrate the town’s 375th anniversary in 2013, the Hampton Historical Society obtained high resolution images of the eight original documents, courtesy of the Massachusetts Archives, the Massachusetts Historical Society, and the Town of Hampton. The images were installed as part of the Tuck Museum’s ‘Founding Hampton’ exhibit, a special presentation of early town history funded by Mr. Alfred Casassa in memory of Hazel Simonds and Olga and Herbert Casassa. Please visit the museum some afternoon to see these fascinating documents for yourself. Originally published in the Hampton Union, August 4, 2015. History Matters is a monthly column devoted to the history of Hampton and Hampton Beach, New Hampshire. 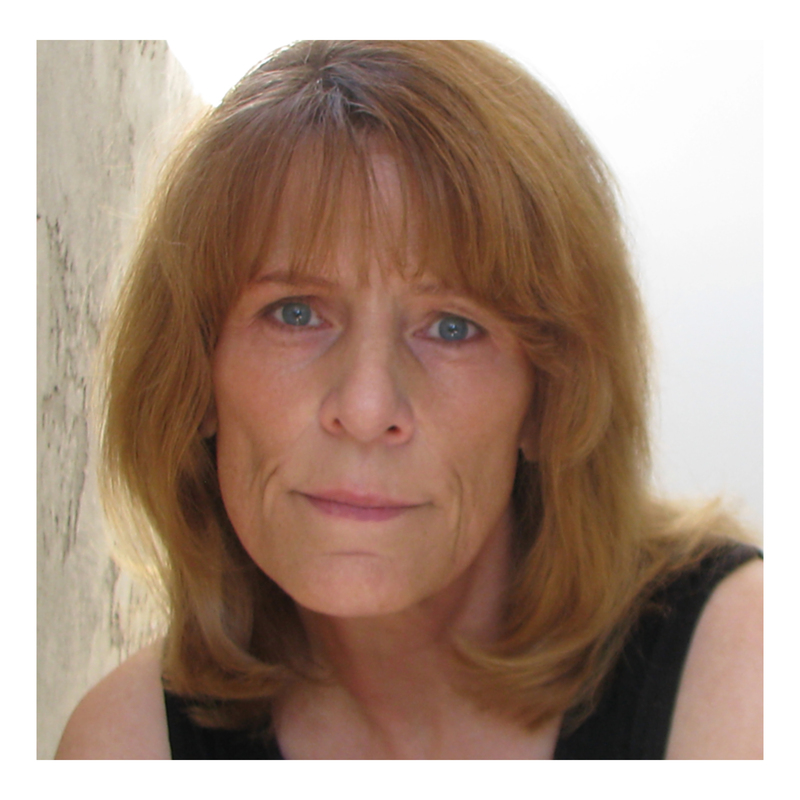 Cheryl Lassiter is the author of three books of local history, including “Marked: The Witchcraft Persecution of Goodwife Unise Cole, 1656-1680.” Her website is http://www.lassitergang.com. Cheryl – The “Founding Hampton” exhibit at the Tuck Museum is truly fantastic! I hope all Hampton Historians and soon-to-be historians, will stop by to see this marvelous display of early chronicled Hampton – and please thank Mr. Casassa for donating the funds to provide us with the opportunity to relive Hampton’s birth.